The guys at Baker Days Cake Specialists were recently in touch to see if I wanted to review one of their letterbox style cakes. I didn't even have to think about the answer. I absolutely love Birthday cake. 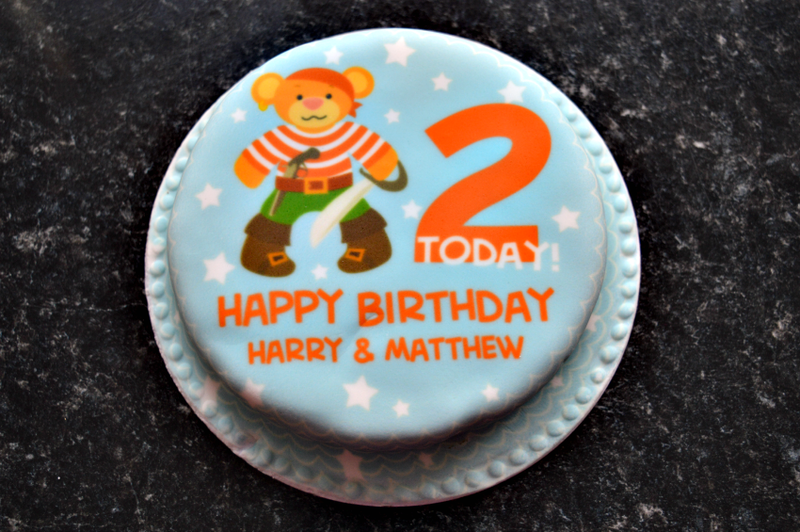 Even better, was that they were happy to decorate it for me for Harry and Matthew's 2nd Birthday, which is tomorrow. The cake arrived in a white cardboard box, which securely held the contents. 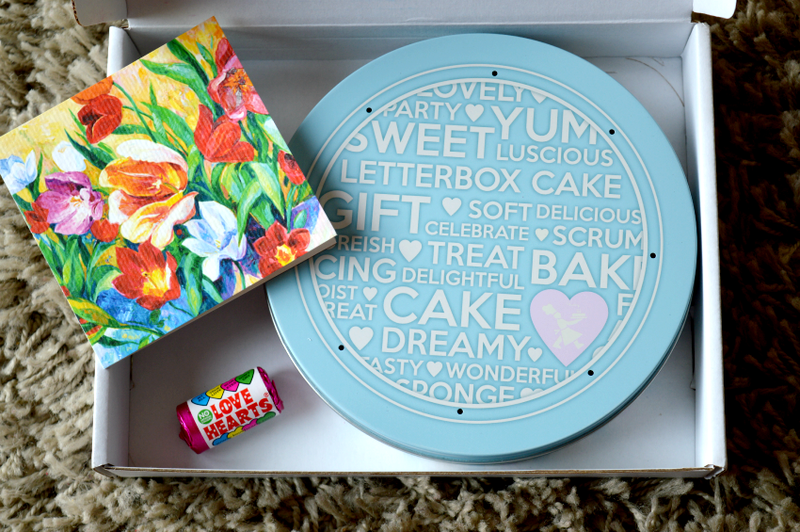 As the picture above shows, there was a tin inside containing a 5" Birthday cake and some nice little extras like the tube of Lovehearts and a gorgeous little blank note card. I couldn't wait to see what was inside and I wasn't disappointed when I took the lid off. The cake looked amazing and it was all intact despite being delivered through the letterbox. I was very impressed. Baker Days are cake specialists who produce cakes in six different flavours, including gluten and dairy free. They produce cupcakes and small, medium and large cakes in addition to the letterbox one, I received. All designs can be personalised and they produce cakes for any occasion, even one for passing your driving test or to say sorry to somebody. I don't know about you, but I never like to cut into cakes even though I want to eat some, but it had to be done. I don't like spoiling the way it looks. I was sent a chocolate sponge version to review. It was lovely and moist, but fluffy too and very chocolatey without being sickly. It was very nice indeed. Lauren also had a piece and this was what she thought. If you are looking to surprise somebody in an unusual way, I would highly recommend Baker Days letter box cakes. Why not order one today? or even better why not try to win one in my giveaway. A 5" letterbox cake is to be given away. Entrants from the UK only. Rafflecopter will be used to select the winner of the giveaway. The prize will be shipped direct from Bakerdays, not Twinmummyyummy. You will need to provide a valid email address so that they can contact you, if you win. Thank you for entering and good luck. 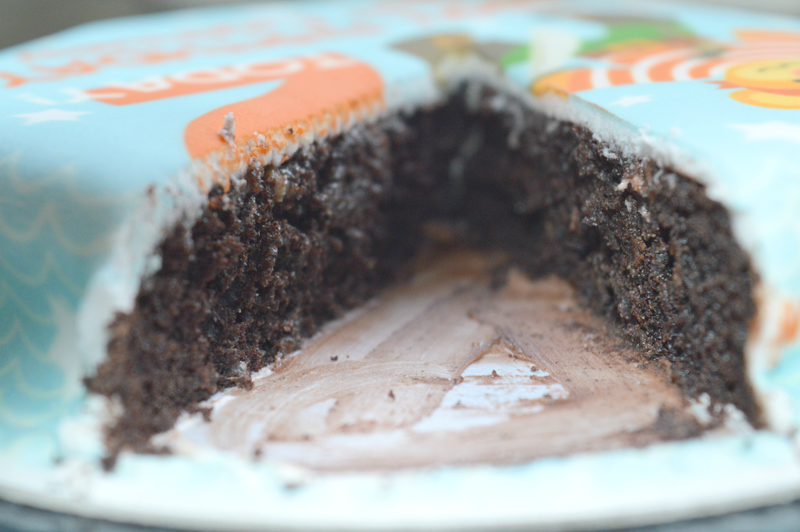 We were sent a 5" letterbox sized cake to review. All opinions are honest and belong to Lauren and I. For my dad on Father's Day! Thank you! I'll be 50 this year, that deserves cake!